The Construction Management program offers skill training for employment in entry-level positions in the construction management industry. Studies include courses in success skills and practical mathematics including general math and algebra. Construction mathematics will use industry applications, building on geometry and trigonometry. Students start construction management core courses with intro to construction management, materials and methods, mechanical & electrical systems, and civil construction materials. Then, students will begin a construction project controls sequence that includes three (3) courses in plan reading & quantity takeoff in three distinct disciplines (architectural drawings, civil drawings & piping & instrumentation drawings), building construction cost estimating, industrial cost estimating, and project planning & scheduling. 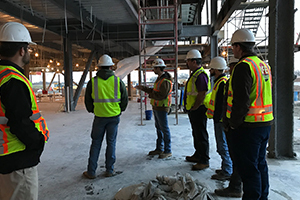 Students will learn to use an array of management techniques in a course dedicated to project management, as well as courses in construction contract & ethics and safety. Technical writing covers the need for effective technical communication in the workplace. Students will take a 3D/BIM course using industry standard visualization software. In addition, the students will have a wide variety of elective courses that will further enhance their knowledge base. Students will conclude the program with a capstone class focused on project controls with management presentations. Teaching methods include demonstrations, solving problems using drawings, and lectures in a laboratory environment. Studies are individualized and progress is monitored with assignments, quizzes and laboratory evaluations.